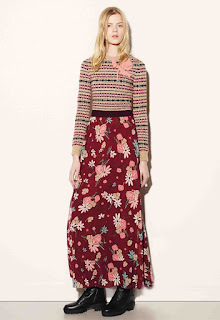 REDValentino FW2015 Collection is a point of view, it is free from schemes, individual. It is an attitude, too striving on unprecedented associations. It is a character, most of all unconventional and soigne, sensual yet rebellious. The girl is a dreamer just as much as she's concrete. She writes her own rule book, day by day, according to her whims. Spontaneously, relentlessly, instinctively. She rejoices in clashes as she does and she undoes, solely following her guts and flair. She picks up bits and pieces wherever she pleases: high & low, old & new, street & elite. She's passionate, emotional, peculiar and detached from the stiffness of pre-set dos and don'ts. She's assertive, yet soft and she's herself, anytime. Kurt Cobain and Federico Fellini, soigne pauperism, Gelsomina and eccentricity. An avalanche of checks cut with frills and point d'esprit. Circus knots peppered with childish collars. Peaceful parkas and kindergarten stockings making a pair with massive wedges. Jumpsuits, denim and a dash of blue collar pragmatism. Stripes, dreamy prints, layers of innocence. Red scarves as cinematic accents. Flannel and flowers, leopard spots and army boots. Little capes, tiered dresses furry spots. Short-short or super-long, nothing in between. Off-kilter bon ton and ladylike insouciance. Sheepskin jackets swarming in childlike drawings. Naive applique on purses and sweatshirts. Self-confidence and I-don't-care-irreverence. Felt, fake fur and everything tactile. Black, deep red, green, white, grey, light blue, flesh mixed in idiosyncratic ways. Mary-janes, stacked heels, demure bags: dreamy neorealism as an everyday accessory.